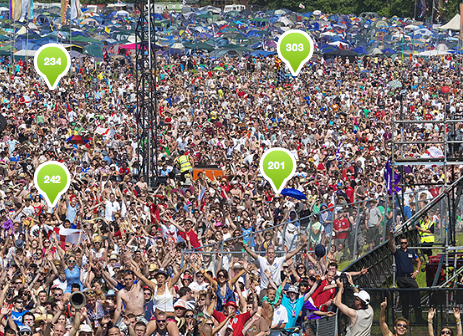 Back in June, we reported on an attempt by the organisers at the Glastonbury Music Festival and event sponsors Orange to break the World Record for the most people tagged in an online image. A 1.3 Gigapixel super high-resolution photograph was taken to celebrate the festivals 40th anniversary, capturing over 70,000 people in attendance during half-time in the England vs Solvenia World Cup match on the first day of the event. As soon as the photo was taken, it was immediately uploaded to Orange’s Glastonbury microsite, enabling those that were present at the event to tag themselves and find people they might have met during the match. On September 7, when the count was officially recorded, the number of people tagged stood at 7,053, breaking The Guinness World record for the “Most People Tagged in an Online Photo”. Even today, the number is still increasing. Festival goers are able to head over to Orange’s Glastonbury microsite and tag themselves in the photo, giving them the chance to be part of the world record in the process.